Medium vs WordPress: Where Should Your Blog Live? That format, the head-to-head, X vs Y post, is still absurdly popular, with one of the most common being Medium vs WordPress. For good reason, too. Both Medium and WordPress are fantastic platforms with a lot to offer bloggers. When considering where your blog should live, you need to know there is no wrong choice here. You would do fine with either Medium or WordPress, but hopefully I can guide you through some of the more stand-out features for both to help make your decision a little easier. When considering whether to go with Medium or WordPress (.com or .org), you need to think about what you need out of your blog or publication. Is it a personal blog you’re doing as a hobby, or are you going to monetize it eventually? Are you going to sell products on your blog, and how much discussion will take place on your articles themselves versus social media? How much static content will you have? Once you’ve got a few answers rattling around in your head, read onward. Medium is a relatively new publishing platform, having launched in August 2012. That’s a full 10 years behind WordPress–at least when you consider how long WordPress has been around–but it’s become a staple among the internet’s blogging scene. Medium was started by the same fella who helped start Twitter, Evan Williams. His involvement is important because more than anything (well, outside of being a publishing platform), Medium is about social connections and people. The content is important, of course, but the number of ways that writers and their audience is fundamental to the experience. You can clap for articles you like, share with friends and followers, and even highlight portions of text to comment directly onto instead of starting a thread after everything is said and done (though that is possible, too). Then, those comments are linked back to your own profile, where your followers can see them and join in on the conversation. Medium is an experimental platform in a lot of ways. It’s not beholden to any precedent, so the company can try new things and see what works. One of their neater features is called Series, which is a mobile-only publishing tool. 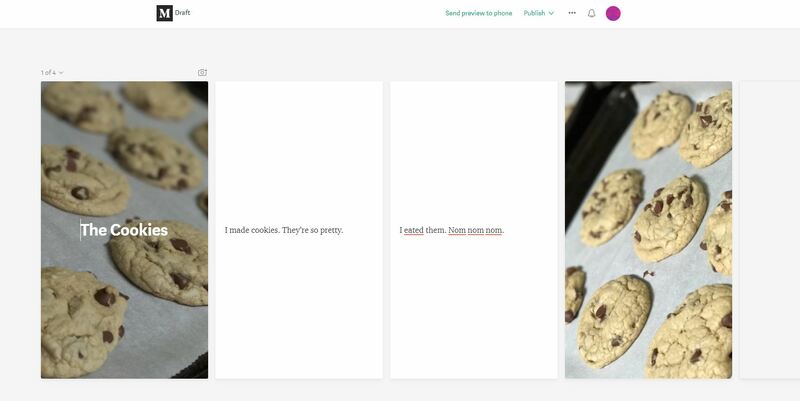 Similar to Instagram or Facebook stories, Medium’s series give writers the ability to publish serialized content in a card-based magazine. You add photos and text to the cards, and as the story you’re telling progresses over time, you continually update the same Series. The selling point of this being mobile-only is that it’s bite-sized, easy to read and navigate, and unlike other social platforms where this type of content disappears after a while, any Series you publish remains live–just like any other blogs you’ve written. Not everyone will care or take advantage of Series, but if you’re up for trying new formats, WordPress doesn’t have anything even similar to this. Medium is clean. No, not in terms of content rating, but in terms of design, style, and UX. It just works. Medium is a writer’s platform if there ever was one. Sure, you can embed images and videos. But they are kept to a functional minimum. They aren’t the focus. The words are. A white background with black text in a single column in the center of the screen. That’s all you need to get your point across. Heck, sometimes there isn’t even a menu bar at the top. When you use Medium for your blog, you’re saying that yes, content is king and words are his bannermen. Pretty much hand-in-hand with the clean, minimal style, Medium is a hot rod. Performance-wise, your blog is fast and furious and ready to win whatever street race you put it in. From posting to browsing to reading to connecting with friends and sharing content, everything you do on Medium is pretty blazing. Because the platform is focused on one thing–publishing–it removes much of the bloat that can slow down other blogging platforms. With Medium, writers can write, and they can write fast. Because Medium is made for writing. Fast. Not everything is sunshine and lollipops in Mediumville, though. If you’re the kind of person who tweaks their blog all the time, working on font pairings, colors, and header images…you just might hate it. Because you can’t do any of that. You get to upload your avatar, pick your own bio, and if you have a publication (basically a collaborative blog multiple people write), you set a color scheme and an logo, that kind of thing. But you’re not changing anything else. Medium is Medium is Medium. Ahhh, WordPress. You delightful beast, you. Obviously, here at Elegant Themes, we love WordPress. We use WordPress, and we promote WordPress as much as we can. Now, that doesn’t mean that WordPress is the best choice for everything all the time, but here are some of the reasons it might the the right one for you. Where Medium takes away your ability to choose a lot about the design of your blog, WordPress gives you unprecedented control. With themes, plugins, and widgets at your command, there’s literally nothing you can’t do (website-wise, that is. Cold fusion and perpetual motion are still out of WP’s orbit). If you’re the kind of person who tweaks stuff constantly, adds elements, takes them away, changes the user experience all the time, then WordPress gives you what you want. Medium might be constraining for you, but WordPress will free you from those shackles. If they’re shackles at all. Plus, if you’re an Elegant Themes member, Divi makes it incredibly easy to build a Medium-clone that runs just as quickly. Just sayin’. If your website is more than just a home to your blog, or your blog is perhaps not the primary focus of your website, WordPress may be the best bet for you. Selling your products, taking reservations and planning events, WP has you covered. The downside to WP being a fully realized CMS (content management system) is that it can have a learning curve. For you to blow all its whistles, ring its bells, adn get it to jump through hoops, you have to put in a bit more time than you do with Medium. If you need more, you can do more. And if you need less, you don’t have to use it all. Like I said in the beginning, it’s up to you and what your needs are now (and what they’ll be in the future, too). One downside to WordPress is that because it does so much so well, it doesn’t have a focus on certain features like Medium. One aspect of where WordPress is severely lacking in comparison is social networking. Yes, you can share your posts to any network you’re a member of, and your readers can leave comments at the bottom of posts in threads, there’s not a lot of interactivity between users within WordPress itself. Some plugins like BuddyPress and Disqus try to fix that shortcoming, but in actual use, they’re nowhere as smooth and seamless as Medium. If being able to directly interact with your readers is important to you, WordPress may fall a little short. It’s not that it can’t do it, but it’s not made for it. Medium is. And then there’s the age-old argument of who controls your content. What do you do if Medium goes kaput? Where do your blogs go? If they live over there on Medium’s cloud, what happens when it’s all rained out? Well, that’s kind of a big reason that folks go with WordPress. Maybe the main reason. If you’re using self-hosted WordPress (the .org version), you have total control of your files, WP installations, words, everything. Unless something catastrophic happens or you decide it’s time to close up shop, your blog and its content will be there. Most likely, Medium isn’t going anywhere. Even the old workhorses of blogging such as TypePad, LiveJournal, and Blogspot are still trotting along. But there will come a day when it goes the way of Friendster. If you don’t have a backup, you lose that content. And that’s a worry. But it’s not the worry. With WordPress, you get direct access to your followers. They subscribe via email, and then you can interact with them as you wish. You can segment, group, A/B test, individually reach out, whatever. You’re in control of that list, and you always know who those people are. My point is that if you re blogging, you’re building a community. Not only that, you’re building a relationship with each and every person who reads your stuff. Combine these two issues of control (both for content and for followers), and you have a big reason folks go with WordPress over Medium for blogging. Being the one with final say over everything has a lot of appeal. It’s one of the reasons people love Divi so much, when there are other hosted site-builders out there. In the end, I don’t think there’s a clear winner. There are enough benefits to both platforms that choosing one over the other leaves some nagging doubts. So use both of them. Put your articles on both platforms! When you use their import tool, your site keeps its canonical link juice, and you get access to pretty much everything Medium has to offer. It really is the best of both worlds. See, it doesn’t have to be Medium vs WordPress at all. But if your blog has to live somewhere, I do think that WordPress is the better option. But you should totally be using both platforms. In using both platforms, I would still suggest putting only your best content on both platforms. You are going to be using Medium as a way to push traffic to your site, to get visitors on your own hallowed ground so that you can convert them from just readers into friends and customers. Since your content may live on WordPress, you want people to have incentive to visit there. If it’s all on Medium, then what’s the point of sending them back? You want to have the best-of-the-best championing your cause and bringing people back to headquarters. In order to do that, make use of Medium’s social features. Clap for people, comment/highlight/share other folks’ stuff. Publish a couple mobile-only Series and write content on Medium that might be better suited for–gasp–Medium. As for where your blog lives, I do think WordPress is the better home base for most people. But if you think that means I’m saying you should not blog on Medium, well, that ain’t true at all. I sure wish Elegant Themes would put some attention to the blog module for Divi or at least address why they don’t. Medium is seen nowhere closer to WordPress. I have been using both the platform since last few years and always add source from in the end, never knew they had plugin too for managing duplicates… great catch for me 🙂 Thanks a lot B.J. Yeah, that changed a lot for me, too! My question is: how to put the social sharing icons floating in the post? There is a plugin or there is a way using a CSS class? I just know about Medium when i read this article, so i think it more comfortable to use WordPress because more user friendly. It really can be. I love the UX that Medium gives because it’s so no-frills. Starting out with WordPress can be kind of scary. You are telling true and you sheared to us useful content. according to my own opinion, WordPress is best from all other cms. I am searching for a plugin which can share a single post to almost all social networking sited automatically. A very useful post for a newbie like me! Hadn’t even considered Medium but this will make me take a look at it. Thanks! It’s worth giving a gander. It may not work for you at all, but if it hasn’t been on your radar, this is a pretty good time to at least check it out. 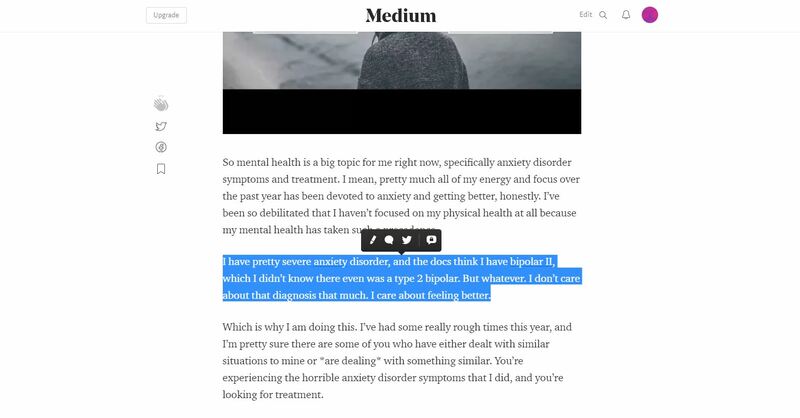 As a once-successful blogger from the days when uploading even a 300×300 pixel image to any of the blogging platforms was a major undertaking my first question would be how related are Medium’s speed and their near-exclusive focus on text? Because text is easy to do very fast, imagery is hard. As a big fan of the write once publish (or link) everywhere philosophy I want to thank you especially for letting us know that Medium will correctly import posts with a canonical reference to the originals. I love that! In particular it helps nullify the question of whether they platforms compete. At least for my business clients, blogging isn’t their business, it only supports their business. Being easily able to share content to Medium expands their footprint without sidelining their need to convert customers and not just attract readers. Nice write up B.J.! Thanks! Interesting. But when to use plugin as a wordpress application, there in the medium how does it work? This is a great blog. I will try to optimize things. Medium is great social platform and drives a considerable amount of visitors. And i doubt if Medium can allow one to display ads, or does it? Is there an easy way to put my medium post on my Divi blog?